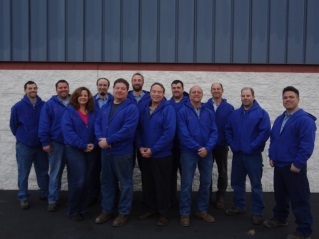 The term HVAC is an acronym for â€œheating, ventilating, and a/câ€� and covers a lot of territory. A/C Service Inc. serves and installs rooftop heating and a/c units, split-system heating and a/c units, boilers, ductless split system a/c units and heat pumps, VRF (variable refrigerant flow) heat pumps, gas-fired and hot water unit heaters, air cleaning systems (including HEPA systems), Clean Rooms, Spectrometer Rooms, exhaust systems, air intake systems and makeup air systems, as well as ducting systems that support all of the above. 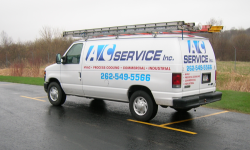 A/C Service Inc. specializes in installing and servicing equipment that provides chilled water for the plastics, metal working, and printing industries among others. This involves everything from 1-ton portable air-cooled chillers for use on laser and plasma cutting equipment, up to and including 300-ton Turbocor state-of-the art centrifugal chillers that utilize oil-less magnetic bearings and VFDâ€™s to provide unsurpassed operating efficiencies as compared to conventional chillers. 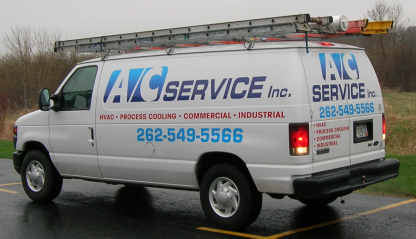 A/C Service Inc. has installed and presently services the a/c systems in many Computer Rooms, Server Rooms, and Telephone Equipment Rooms. The systems for these spaces include state-of-the art Liebert environmental control units that can control humidity and temperature, to temperature control-only Mitsubishi ductless split systems. Engineering/Design services for any of the systems we service or install are available, including HVAC design and specification, chiller design and specification, boiler design and specification, duct design, etc.